Cold Springs Fire, visible beyond the CSP road closure point. Numerous Public Safety employees mobilized in response to multiple wildfires that flared up throughout the state starting on Saturday, July 9. State Patrol Troopers were among the first to report the Cold Springs Fire outside of Nederland. The Division of Fire Prevention and Control quickly mobilized one of two Multi-Mission Aircraft to the Cold Springs Fire to map the fire and provide critical information about the fire. 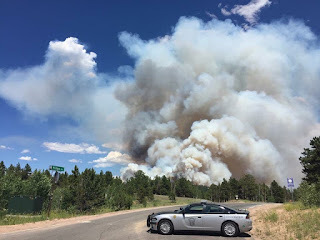 By Sunday, July 10, emergency responders were fighting fires in Fremont County (Hayden Pass Fire), near Leadville (Lodgepole fire), and just off of C-470 and I-70 (Hogback Fire). The Colorado Division of Homeland Security and Emergency Management (DHSEM) activated the State Emergency Operations Center (EOC) for eight consecutive days to offer support statewide. 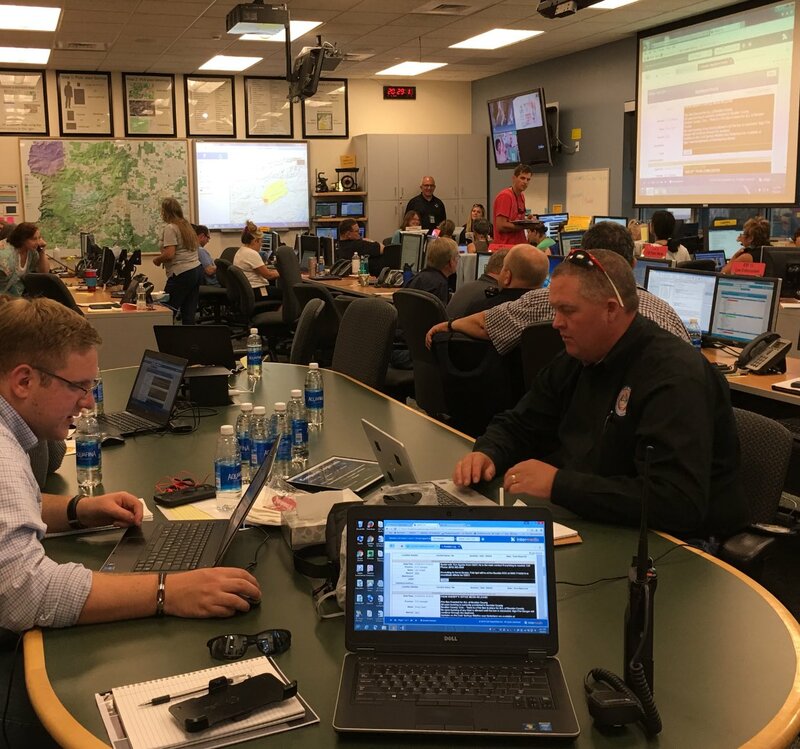 More than 20 workers from DHSEM and DFPC staffed the EOC to support resource requests and provide technical support to the local jurisdictions responding to the fires. Many of them worked long shifts from Saturday to Saturday, giving up evenings and weekends to be there in support of the disaster response. In addition, representatives from both divisions deployed to provide their expertise on-site at the Cold Springs Fire and Hayden Pass Fire responses. As local fire agencies responded, Troopers assisted their efforts by setting up and managing road closures - both to keep the public out of areas too dangerous to enter and to enable the free flow of emergency response vehicles and equipment. DFPC Fire Management Officers mobilized to provide direct technical assistance to the local jurisdictions, and DFPC deployed both Single Engine Aircraft and Multi-Mission Aircraft to assist with mapping, tracking, and fighting the fires. DFPC has secured a Fire Management Assistance Grant (FMAG) allocation for the Cold Springs Fire to assist with firefighting costs.